Licking Memorial Health Systems (LMHS) is proud to be named as one of the nation’s Best Places to Work in Healthcare by Modern Healthcare. LMHS provides a wide range of employee benefits. This summary is intended to highlight these benefits and is not a statement of policy or contract. In the event of any inconsistency between the information provided here and the actual provisions of any contract or policy, the provisions of the contract or policy shall govern. The following video must be viewed prior to applying for positions. After viewing once, you will have complete access to the LMHS Job Search page in the future. 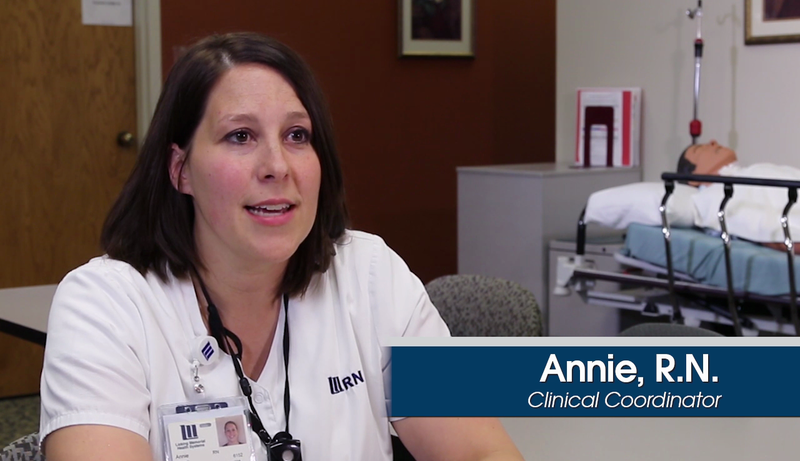 Annie, R.N., discusses the high level of orientation provided to LMHS clinical staff. Rob describes community involvement. Employment at LMHS is more than just a job. Janae Davis, M.D., highlights why LMHS is a great place to work. Jerry, R.N., talks about how employees share in organization success. Nemili, R.N., describes LMHS information technology and its incorporation into patient care. Rebecca discusses the employee wellness opportunities and initiatives at LMHS. View this video (left) for access to the LMHS Job Search. For more insight into careers at the Health Systems, additional videos are available below, or scroll down for a selection of employee benefits offered at LMHS. You will be asked to create a new username and password. Please select an email address you monitor regularly, as the majority of communication during this process will take place via email. Paid time off (PTO) accrues each pay period for regular employees, to provide for vacation, holidays, sick time lasting fewer than four consecutive scheduled work days and personal days. LMHS pays the full cost of this benefit. A comprehensive group medical insurance program is provided through the LMHealth Plan for regular employees and their eligible dependents. Access to both the LM Select and the HealthReach networks is available, and prescription coverage is included. Employees share in the cost of the premium. Basic vision coverage is provided for all eligible employees. This option provides an annual eye exam with a VSP provider. LMHS pays the full cost of the premium for eligible employees. Employees will share in the cost of the premium for family coverage. Additional vision coverage may be purchased. This option offers allowances and discounts toward prescription eyewear and contact lenses, as well as discounts and savings on laser vision correction. A comprehensive dental plan is provided for full-time employees and their eligible dependents. Access is available to both network and non-network providers – copays and deductibles apply. LMHS pays the full cost of the premium for eligible employees. Employees will share in the cost of the premium for family coverage. A group life insurance benefit is provided for regular employees. Coverage for dependent children is included. LMHS pays the full cost of this benefit. All employees who are eligible for the basic life insurance may purchase supplemental life insurance coverage. See the life insurance packet for details. Short-term disability pay accrues each pay period for full-time and part-time employees to provide paid time off for an illness or injury lasting four or more consecutive scheduled work days. Employees may accrue up to six months of full pay for this purpose. LMHS pays the full cost of this benefit. All full-time and part-time employees begin accruing short-term disability leave hours immediately upon employment. Employees are eligible to use accumulated short-term disability leave after three months of employment. Supplemental short-term disability insurance may be purchased by full-time and part-time employees. This coverage may be used by employees to supplement their short-term disability bank through the LMHS disability accrual system. All full-time and part-time employees who work at least 20 hours per week are eligible to purchase this supplemental coverage. If purchased, the coverage will be effective the first of the month following their hire date. This policy has a pre-existing clause. Long-term disability insurance is provided for full-time and part-time employees. Benefits begin following 180 days of debilitating personal illness or injury and provide 50 percent of monthly base salary. LMHS pays the full cost of this benefit. All full-time employees and part-time employees who work at least 1,000 hours per calendar year are eligible. Coverage becomes effective on the first day of the month following employment. Supplemental long-term disability insurance may be purchased for full-time and part-time employees. Supplemental benefits begin following 90 days of debilitating personal illness or injury and provide 60 percent of monthly base salary. The employee pays the cost of this additional coverage. All employees who are eligible for the basic long-term disability insurance plan may purchase this supplemental coverage. This policy has a pre-existing clause. The flexible savings plan allows employees to set aside pre-tax dollars to pay for dependent care and healthcare expenses not covered by insurance. An easy-to-use debit card is provided to pay for qualified expenses. Employees may accumulate funds into this account through pre-tax payroll deduction. All employees are eligible immediately upon employment. Employees must re-enroll annually in November. LMHS provides employees an opportunity for retirement savings via the 403(b) plan. As of January 1, 2018, eligible employees will receive an employer contribution each pay period. Additionally, employees may elect deferrals from their pay into this account as well. Highlighted by a new Employee Wellness Center, this program features free onsite fitness classes daily and an assortment of other offerings to help employees maintain a healthy and balanced lifestyle. A tuition assistance plan is provided for regular employees to further their education or gain certification that will enhance their effectiveness within the organization. Courses must be taken at an accredited or Hospital-approved institution and must lead to a degree, diploma or professional certification. LMHS offers both clinical and non-clinical employees opportunities to further their professional development. Clinical employees receive access to applicable annual training on relevant clinical topics, as well as online resources assisting in maintaining licensure. Non-clinical employees receive training in areas such as Microsoft Office, communication skills, and management skills. CPR training is offered free of charge for all employees. An adoption benefit is provided for qualified expenses up to $2,000 for the adoption of a child under 16 years of age. LMHS pays the full cost of this benefit. EAP offers initial consultation and referral for employees and their immediate family members who are experiencing problems such as drug or alcohol abuse, financial or marital problems, depression or conflict in the workplace. LMHS pays the full cost of this benefit. A uniform allowance is provided to all employees who are required to be in uniform. The LMH Café provides employees with a 25 percent meal discount on food and beverages purchased. In addition, coffee and tea are provided at no cost to employees. Free onsite parking is a convenient benefit for employees.